The sky is the limit for about 50 girls aged 12-18 years at Nhulunbuy High School who have been involved with the Stars Foundation in the last 18 months. 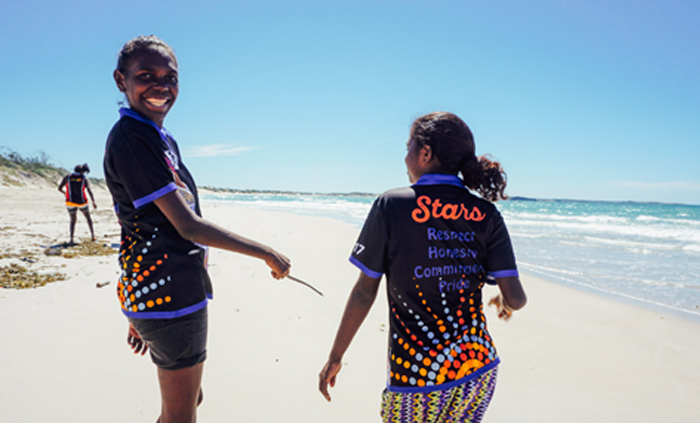 Stars Foundation Nhulunbuy Program Officer Leicolhn McKeller said the program supports Aboriginal and Torres Strait Islander girls and young women to make active choices towards realising their full potential. “Stars is about respecting each other, building each other up and resolving conflict. There is no hierarchy here. It’s not like a parental relationship. We are there to guide them, instil life lessons and life skills,” she said. Stars offers the girls access to full-time mentors and runs a variety of sporting, social and community events to help them develop confidence, socialisation and life skills. “We might focus on introducing them to spaces they would not access or might avoid. That could be the local restaurant that they’ve never been inside because it’s really intimidating,” Leicolhn said. “Or we might go to the most scenic spot. Do some fishing. Gather oysters. Cook our own food. Leicolhn said the program has made positive impacts on the students and their personal development. “The girls are more confident within the school environment, more confident in themselves, more expressive with their peers and teachers,’’ she said. The Stars program operates in eight schools across the Northern Territory, including Sanderson, Dripstone and Nightcliff middle schools (Darwin), Casuarina Senior College (Darwin), Katherine, Nhulunbuy and Tennant Creek high schools and Yirrkala School.